Ang Vaughn: Come Meet Erica from Annabel and Lee! Come Meet Erica from Annabel and Lee! Hey, everyone! Tuesday's guest blogger is one of the first bloggers I met back in April when I started mine. Erica's blog instantly became one of my favorites because she and I both share a love for cute dresses, good books, and I adore her tattoos near the bottom of her legs that say, "Be Brave" (what a good reminder!). This well-read lady is a gem! Hey all! I’m Erica, a blogger over at Annabel and Lee! I am a writer, I love cheese fries, I am enthusiastic about Jello, and I sometimes hold my own hand. (it happens. okay?….). Angela was sweet enough to invite me to be one of the guest bloggers while she enjoys her vacation this week. (lucky girl!). 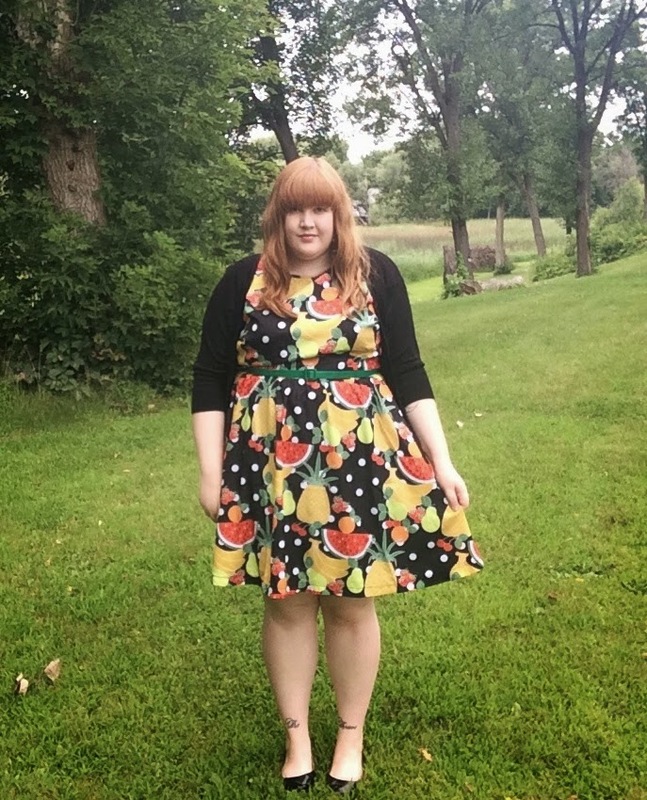 I wanted to share this recent find from ModCloth with you today. ModCloth is a heaven on Earth (right along with cheese fries) for any vintage inspired, kitschy loving guy or gal. 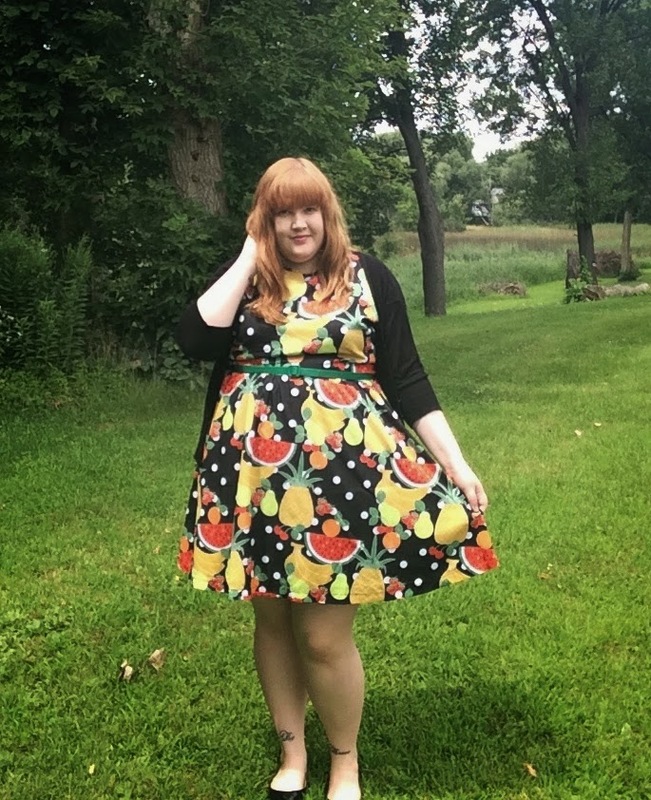 This is their fresh farmer’s market dress that is currently on sale! It is a great addition to my collection of dresses, and it is such a fun and slightly weird pattern which is always a perk. For whatever reason, this was a no make up kind of day for me. Sometimes during the summer putting on makeup feels like too much work when you are just going to sweat it all off, so I decided to go with a fresh naked face! I think going makeup free works great with this dress since the dress is such a statement piece. Over at my blog you will find outfit of the day posts, musings about everyday life, book reviews, and the occasional art that I like to share. I love getting to know new people and supporting new bloggers like myself! Please stop by and say hi! PS- Erica also has an Etsy shop where she sells an awesome collection of vintage + handmade items! She is seriously such a doll (: I read her blog as well! I love her outfits and book reviews so much. She's definitely a well read lady for sure! I had no idea you weren't wearing makeup! You are absolutely gorgeous! I love the quirky print of this dress. It makes me wish I had money to spend. This dress is so fun. And, appropriately named. :) Perfect for a farmer's market, picnic, or just lazing around in the summer. I own way too many Modcloth dresses. I've lost count. So adorable! I follow her on IG--I definitely need to check out her blog!